I stumbled upon Chantelle’s Facebook page, Official Naija Oyinbo by accident but was quickly drawn to its description. It reads in exact Yoruba language, “Ekabo oo…se dada ni…oruko mi ni Chantelle, mo gbo yoruba dada oo…” which translates to “Welcome, hope you’re well. 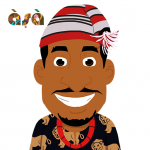 My name is Chantelle, I understand Yoruba very well.” Interesting for a White British lady! Next, her videos and comments from viewers caught my attention. I was tempted to find out more about Chantelle. A light investigation indicated she’s married to a Yoruba man, has 3 kids, visited Nigeria a few years ago and presently lives in the UK. How well can a British born white adult who wasn’t born and bred in Nigeria be well grounded in Yoruba language as she claims? With the declining interest in our native Nigerian languages among many today, Yoruba language is itself a problem for Nigerians born and bred in Nigeria let alone a foreigner. Notwithstanding my doubts, I reached out to Chantelle. What I didn’t anticipate was a challenge. So, when I took her up on proving how much she truly understood Yoruba beyond the few words I’d heard her speak in pre-recorded videos, she was assertive. That assertiveness gave some depth to her Facebook page description. We decided there was no need to argue back and forth. We could prove it transparently for all to see. 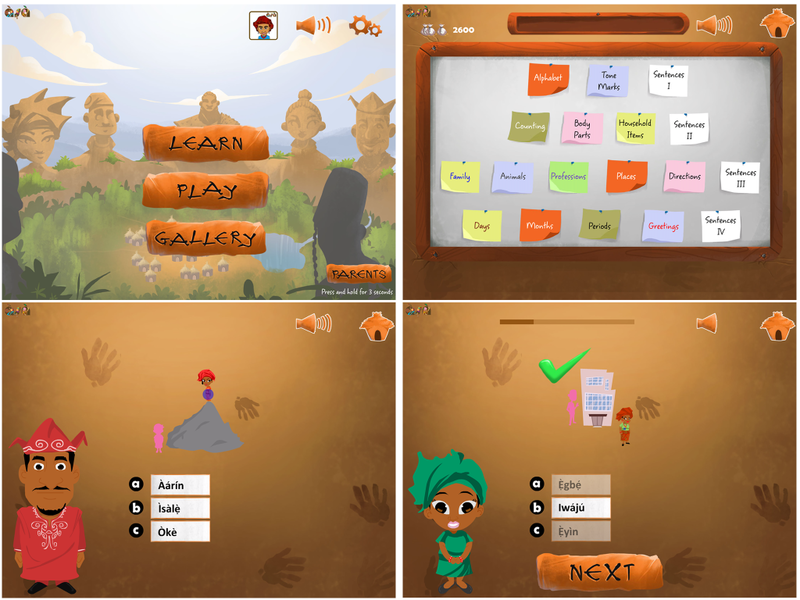 Since she’s based in London while I’m in Lagos, we decided on using the Yoruba101 app; an interactive Yoruba language learning mobile app for Android & iOS devices that is built around a combination of lessons, games and quest to help non-speakers acquire the basics of Yoruba language & culture. 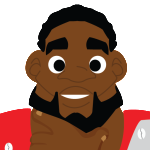 In keeping with the goal of the app, Chantelle had to demonstrate her knowledge of Yoruba language by completing the Yoruba101 app quest. 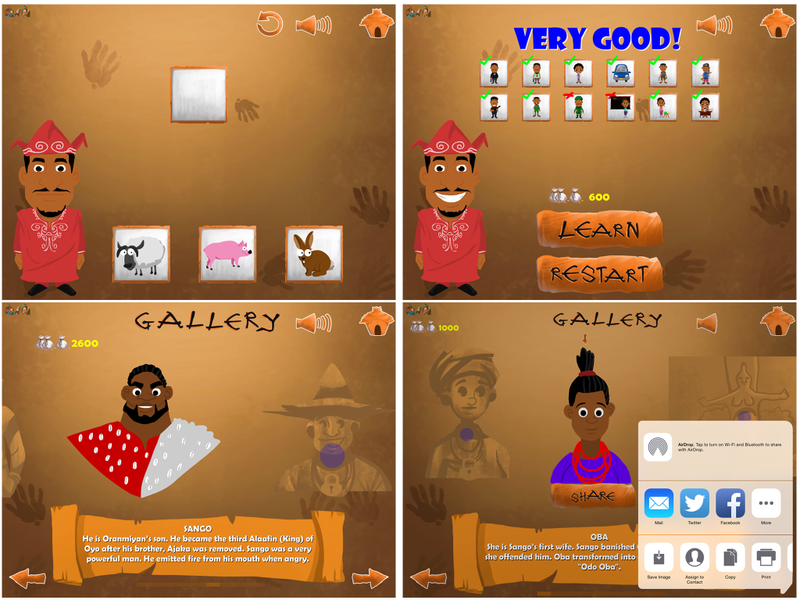 The Yoruba101 app quest involves playing over a dozen games drawn from different Yoruba language topics. 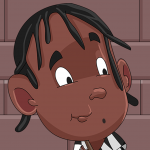 By completing each game excellently, the user unlocks different Yoruba characters with more information about them. These characters include deities Sango, Oduduwa, Osun, Lagelu, Lisabi, Moremi etc. 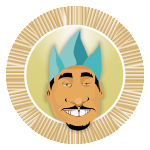 among others who are all termed Legends in the app because of their historical ties to different aspects of Yoruba culture. 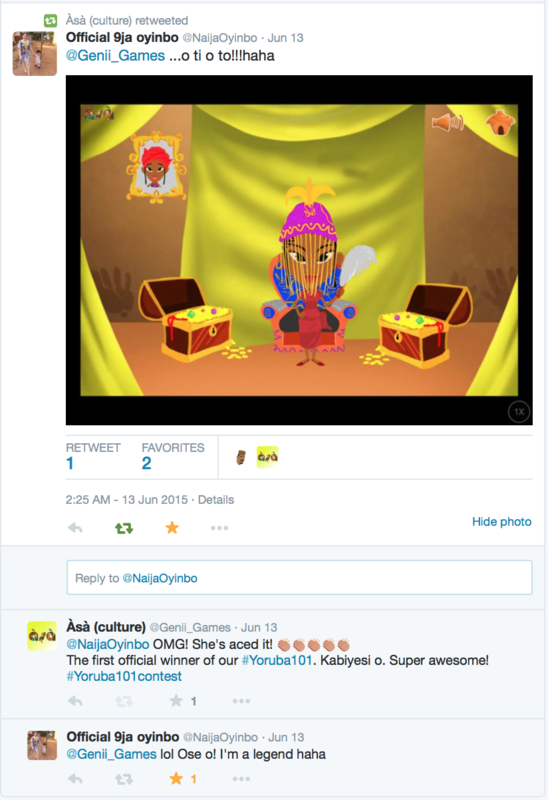 To complete the quest, Chantelle had to unlock all 20 Yoruba legends, share each unlocked character via social media using the social-share button after which she is crowned a Legend within the app. 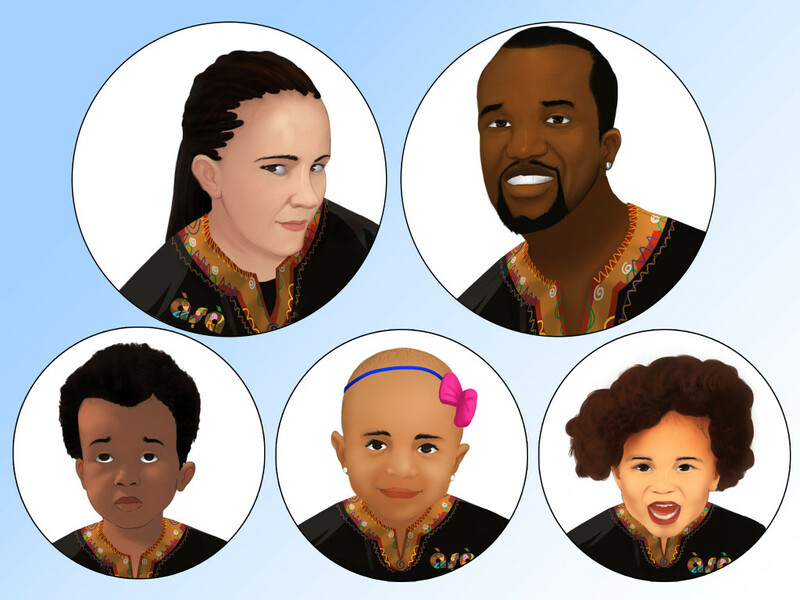 In addition to her crowning within the app, I would also create a cartoon-looking portrait of her entire family. 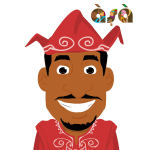 At exactly 11:09 PM on Friday, June 12, Chantelle got off to a start unlocking Legends Eyo and Osun, thus proving her knowledge of ‘Greetings’ and ‘Days of the Week’ topics in Yoruba Language. 8 more Legends– Oya, Eweka, Sango, Lisabi, Ajaka, Moremi, Oduduwa — were unlocked proving her knowledge of the following topics: Places, Household Items, Animals, Professions, Family, Body Parts, Alphabet and Words I. She shared all of these via her Twitter handle, @NaijaOyinbo. Half-way through, we both retired for the night; thankfully, London and Lagos are on the same time zone. The next morning, Saturday, June 13, Chantelle continued from where she left off. She added legends Alaketu, Onisabe, Onipopo, Olofin, Oranmiyan, Oluyole, Oba, Olowu and Lagelu to her list of unlocked characters within the app. These remarkable progress showed her understanding of Yoruba language topics: Counting 1 to 50, Periods of the Day, Directions/Positions, Words II and Months. All through, my Twitter timeline buzzed with every progress as she shared her progress using the social-share feature. I barely had time to keep up with tweets to update those who were following the public contest. By then, I knew we were in for a tight race. This Wythenshawe native didn’t seem like she was stopping. True to her word, Chantelle finished the app with this tweet and message to me. Bingo! She unlocked her user and was crowned in less than 12 hours! On my part, I had her illustrations done to crown her effort. 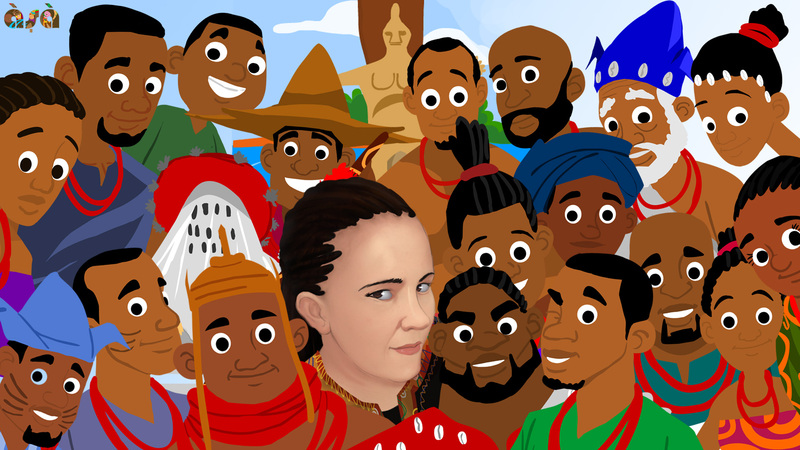 A selfie of Chantelle with unlocked Yoruba Legends: Oduduwa, Sango, Moremi, Osun and more. While it may have seemed like Chantelle had it easy all the way, I know otherwise. For instance, I know she hit a brick wall in the ‘Months of the Year’ game as indicated by our chat. However, she was able to navigate that hurdle by switching to the lessons within the same app, providing her with the knowledge to complete the game excellently. Beyond the fact that she is also married to a Yoruba man, her interest in the language is the defining factor in her understanding of Yoruba. That’s the primary determinant to learning any language. In this age where some Nigerians have come to associate our native languages with illiteracy, seeing a British lady like Chantelle achieve this feat made me proud of my roots. We should all too. To her credit and perhaps to prove how much she truly enjoyed the challenge, she made a video. Hello Bayo! I am a Nigerian-American college student from GA who’s interning with Voice of America in DC for the summer! 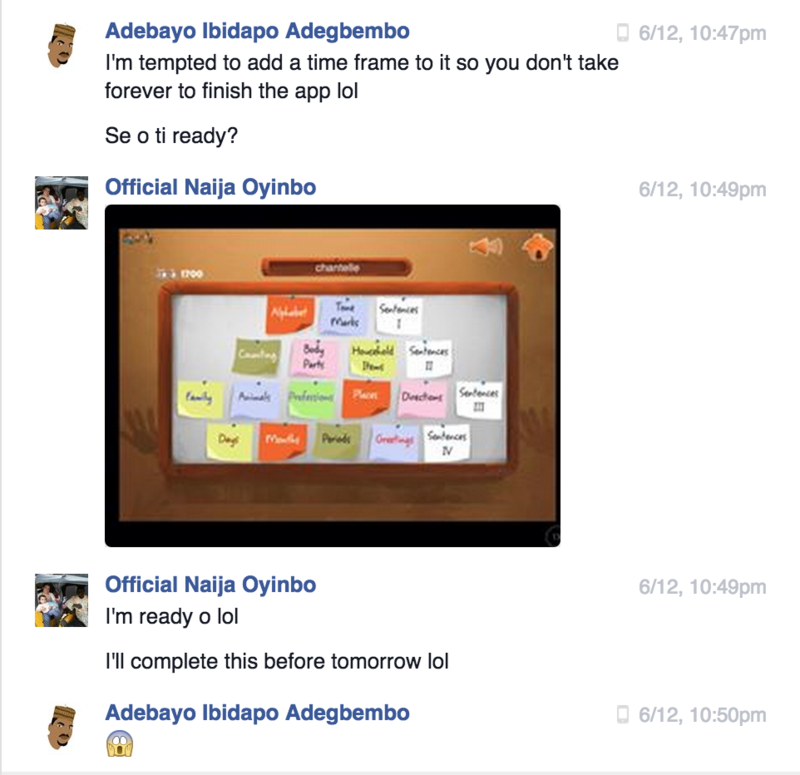 I’m very impressed with Naijaoyinbo to have completed all those challenges! I myself, who grew up hearing Yoruba everyday, am not confident in my ability to complete it as well as she did. 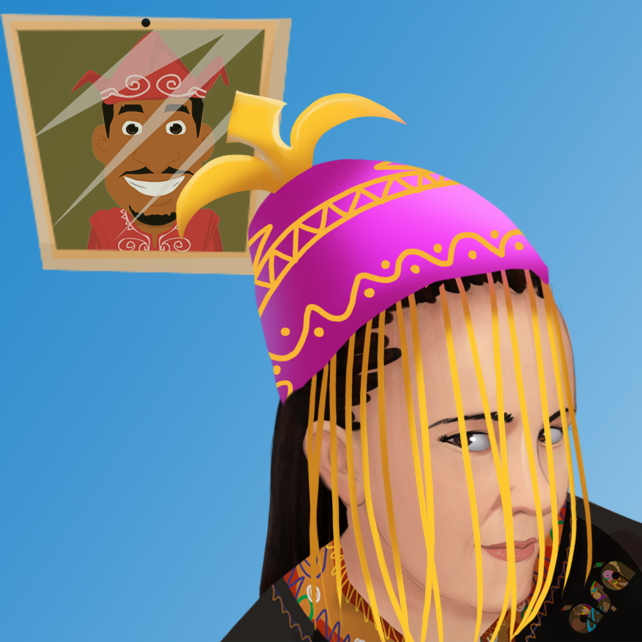 Thank you for creating these apps to teach people aspects of their culture in a fun and interesting way. Way to go! Thanks for the compliment. 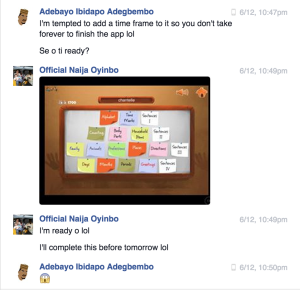 My whole team is excited to see the value in our apps as expressed by you and others. If Chantelle can do it, then you can too Damisi :-)! Thankfully, the lessons provide a way for you to learn and go on to complete the games. Looking forward to celebrating your win too :-). I hope we get most of us(Nigerians) committed to our native languages as Chantelle did even though she’s not even a native.